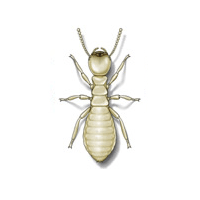 Comprehensive termite treatment technology runs 24/7 to stop destructive pest activity. Modern’s HomeCare Termite Control Service includes an inspection by a trained specialist and a detailed graph of visible termite activity. There are three castes of termites. The reproductives, which are most commonly seen, are about 3/8 inch long. 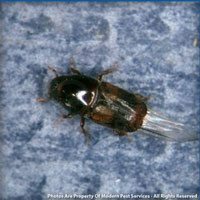 Their wings are brownish-grey with a few hairs. Their body is dark brown to almost black. The soldiers are wingless with white bodies, a yellowish-brown head and large dark mandibles (jaws). The workers look similar to the soldiers, but without mandibles. The average colony consists of 60,000 – 250,000 termites and is located in the ground. They can enter structures through cracks as small as 1/16 inch. The workers will feed on wood, then return to the colony to feed the immature workers, reproductives, and soldiers. A colony of 60,000 could eat 5 grams of wood each day. 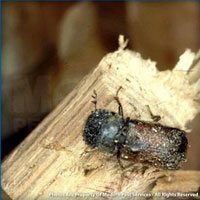 The worker termite prefers feeding on fungus-infected wood, but will readily feed on undamaged wood. The female reproductive may only produce a few eggs her first year, but once maturity is reached she will produce approximately 5,000 – 10,000 eggs each year. On average the eggs take 50 – 56 days to hatch. After hatching, the termite goes through several molts.